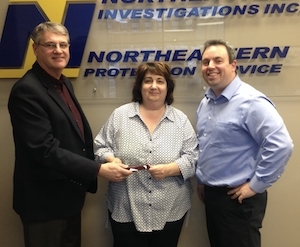 Halifax-based security service provider Northeastern Protection recently recognized Patricia Conrad, administrative manager, with its annual Mark D. Joseph Award. The purpose of the Annual Mark D. Joseph Award for Leadership and Excellence, is to recognize a Northeastern team member who has shown their commitment to the company, our clients and our employees in an exemplary manner. Patti, as we all know her, came to work with Northeastern at a time when we needed an experienced administrative person to bring new skills to the company. She brought a high level of skill, commitment and positive attitude to the position that we don’t always see. Patti pushes those of us around her to be better at what we do, because it is the right thing to do. She volunteers for tasks that others may be reluctant to do, in order to get the job done. Growing up with a family-owned business she clearly understands what commitment means. She has delivered the highest level of commitment to all of us daily since the day she started.